Gannets with their wingspan of 180cm, are familiar birds around the coast of Arran, as they plunge dive from up to 40m above the water to a depth of 15m in pursuit of fish. This method of hunting is spectacular, particularly when a group of gannet attack a shoal of fish. Large air sacs around the gannet’s throat and neck help to absorb the shock of impact when it dives. It can also close its nostrils when diving. A dive can last from 5 to 20 seconds. Other hunting techniques include plunge-diving from a lower height at an angle, and surface diving after dipping the head underwater to scan for prey. Fish will be caught in the serrated beak and only swallowed when the bird surfaces. Fish up to 30cm in length make up most of the gannet’s diet, although it will also catch squid. Prey species include anchovy, capelin, cod, haddock, herring, mackerel and pilchard all of which are fast swimming, open water fish. The gannet’s global range is restricted to the North Atlantic where it breeds in very large numbers contained in just a few major colonies. Whilst there are some colonies on the coast of Newfoundland and Quebec (amounting to about 39,700 pairs), most of the population (i.e. about 223,500 pairs) breed in the eastern Atlantic. Within the East Atlantic, greatest numbers breed in the UK. Between 60% and 70% of the world population of gannets nest around the British coastline. The nearest colony to Arran is Ailsa Craig, one of the largest colonies in the world, with over 32,000 pairs representing around 12% of the breeding North Atlantic population. 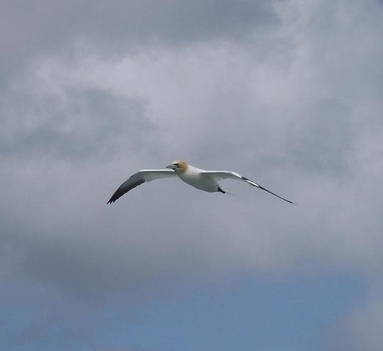 Gannets are present at their colonies from March to September. Although they will search for food up to 600km from the colony during this period, they fish mainly in waters relatively close to the colonies. Fishing trips can last up to 13 hours. The gannet mates for life and usually uses the same nest site. The close proximity of their nests in the colony and the fact that they are extremely aggressive birds, has influenced the evolution of a variety of territorial, appeasement, courtship and grooming behaviour patterns. One egg is laid each year. Incubation is about 45 days and it takes another 90 days to fledge. About 90% of all hatchlings survive and fledge. The parental feeding ensures large fat stores for the chick for migration and energy before they are able to dive and feed themselves. Having said that, between 60 and 70% of fledglings die before they are a year old. The juvenile gannet has black plumage, which gradually changes to adult plumage when they reach sexual maturity in 5-6 years. If they survive that first year they can live for around another twenty years. The long-lived gannet seem to produce enough eggs to result in a stable or slowly increasing population. Outwith the breeding season, the species is pelagic, living on the open sea, occurring not only in inshore European waters to the south of their summer range, but also more widely in the North Atlantic as far south as West Africa.